The U.S. Navy conducted a full power demonstration of a Riverine Command Boat (experimental) (RCB-X) powered by alternative fuel, Oct. 22, aboard Naval Station Norfolk, Va. 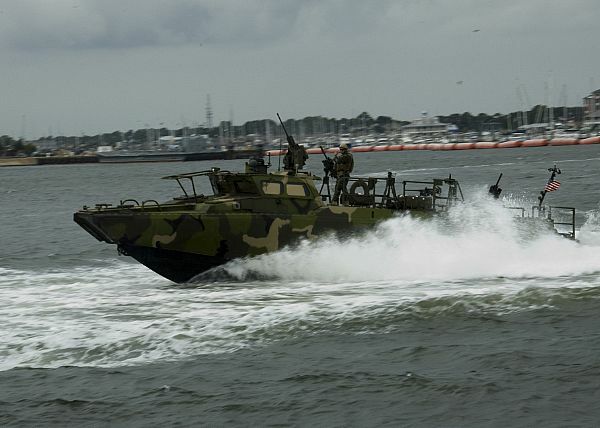 Testing and evaluation of alternative fuels from the 49-foot fast and agile RCB-X boat supports the secretary of the Navy's efforts to reduce the fleet's reliance on fossil fuels and is part of a series of progressively complex tests and evaluations scheduled through 2012. These exhibitions will culminate in 2012 with a Green Strike Group of U.S. Navy ships operating locally and by 2016 deploying a Great Green Fleet powered entirely by alternative fuels. The fuel, a "drop in replacement" to standard shipboard fuel, is 50 percent algae-based and 50 percent NATO F-76 fuel, which forms a 50/50 blend of hydro-processed renewable diesel, also known in industry as "HR-D."
Additionally, HR-D, as opposed to biofuel, does not include water which is incompatible for shipboard fuel systems and does not have the limited serviceable life (typically six months) of biofuels. A blended hydro-processed renewable diesel fuel ensures that the integrity of the fuel system is maintained. The Navy is incorporating a systematic approach of evaluating systems, protocols and standard operating procedures. The testing and certification represents a cost-effective approach for the entire engine inventory. The testing and evaluation is being led by Naval Sea Systems Command's Advanced Fuels program office. Solazyme’s technology will help the Department of Defense reduce its carbon footprint, combat global climate change and lead in the development of clean and renewable energy sources. Reducing our dependence on foreign oil is a national security imperative, and Solazyme’s technology focuses on producing an abundant, domestic and renewable source for oil and fuels. Solazyme’s Soladiesel® diesel fuels meet ASTM, EU, and certain military specifications.